İstanbul, which has a highly colorful cultural heritage that very few cities enjoy across the world, has been inhabited by groups of people with diverse ethnic roots, languages, and faiths that have created interconnected cultural syntheses throughout centuries. İstanbul Research Institute began its programs with the aim to study and present the rich cultural diversity and cross-cultural influences in İstanbul. 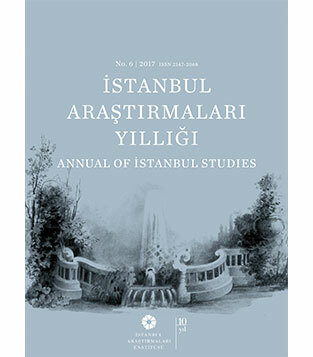 In line with the Institute’s publication mission and within a broad framework that embraces Antiquity, Byzantium, Ottoman and Republican periods, the sixth issue of the Annual compiles works from original research projects on various aspects of İstanbul’s history, architecture, and cultural identity, as well as on the conservation and repair of its cultural assets. The titles of articles presented in this issue are: Mercenary Inscriptions in Constantinople; Remarques sur l’Ambassade Hafside d’Abu Amr Osman et de Molla Arab d’Après les Sources Ottomanes (Abu Amr Osman and Molla Arab’s Hafside Ambassadorship According to the Ottoman Sources); The Plaster Windows of Istanbul; Thoughts on Some Details of Bâbüssaade in the Topkapı Palace; The Dolmabahçe Palace Imperial Chambers According to a 1882 Construction Preliminary Estimate Book: Spaces and Repair; The Defense Network of the Bosphorus During the 17th-19th Centuries in Light of Archival Documents; The Sea Walls of Istanbul and the Problems of Conservation; The Halkalı Waters and the Examination and Restoration of the 1859 Köprülü Waterway Maps from the Perspective of Art History; “On the Sea Mansion of the Late Minister of Provisions Rıza Efendi; “A Sad Story”: Did Architect Vedad (Tek) Design His Daughter’s Tomb? ; Silent Witnesses of Istanbul: Sculptures of the Feriköy Latin Catholic Cemetery; Memory in Glass: Ahmed Rasim, Photography, and Time; What Kind of Lighting: Gas or Electricity? ; Cartridge Production in the Ottoman Empire During the Global Armament Race: The Zeytinburnu Factory.